Detect common signs and cure hearing loss early! Are your Hearing Aids free from dirt? Hearing Loss - Stay Safe from the Silent Killer! An Auditory Brainstem Implant (ABI) is an electronic device like the cochlear implant but it is different as unlike the cochlear implant that stimulates the cochlea, ABI stimulates the brain stem. ABR is a test performed by an audiologist to measure brain's response to sound. Auditory Nerve, also known as cochlear nerve is a nerve that carries signals to the brain. The inner ear is quite sensitive and can be damaged when exposed to loud noise. This is known as acoustic trauma. Devices that are used to process, transmit and amplify sounds are known as ALDs. Usually, hearing aids are not termed ALDs. They also help to eliminate background noises and bring sound to the inner ear. Alerting Devices are used by people with hearing loss. These devices vibrate or flash to indicate about the sounds or events that have happened. Amplifier- An amplifier is something that makes the output signal stronger than the input signal. Amplitude- Physical intensity of a sound is referred to as amplitude. Anvil- Technically known as incus, anvil is the second of the three bones in the middle ear. Apical Region- Low frequency sounds are detected in this region and sent to the brain. Assistive Listening System- ALS is a system which is used to make dialogues accessible. It is used for groups rather than for an individual. Atresia- Malformation or absence of the outer ear is referred to as Atresia. Audiogram- Audiogram is a graphical representation of one's hearing loss. It shows the softest sound one can hear at various frequencies which vary between 250-8000 hz. Audiology- The science or study of hearing is referred to as audiology. Audiologist- An Audiologist is a health care professional who is trained to identify and treat hearing related problems. Audiometer- A device that precisely gauged tones of particular frequencies and intensity levels to obtain an audiogram. Audiometry- The performance of hearing tests is referred to as audiometry. Auditory Brainstem Implant (ABI)- It is pretty much like a cochlear implant; however, unlike cochlear implants, ABI is implanted directly in the stem of the brain. People with ABIs do not hear clear speech, but only environmental sounds. Auditory brainstem response testing (ABR)- ABR measures the electrical impulses that are sent to the brain from the inner ear. Auditory Hallucinations- Auditory hallucinations can be caused by schizophrenia. It could also be caused by some drugs. Auditory reflex- As the name suggests, this refers to the reflex to any sound. Automatic Gain Control (AGC)- Automatic gain control is a circuitry in hearing devices that serves the purpose of automatically adjusting the sound, so that it remains comfortable for the person wearing the device. Automatic Speech Recognition- Automatic Speech Recognition is a system that converts the spoken words to the text format. Any noise that interferes with what a person is trying to hear is termed as background noise. Background noise often makes it difficult for the person with hearing loss understand the speech. Basal region serves the purpose of detecting high frequency sounds and sending them to the brain. Bassilar membrane is the central membrane in the cochlea. Hair cells rest on it and it is contained within the organ of coti. Also known as Behavioral Observation Audiometry, it is a hearing test used with children. A child's reaction such as head turning and eye opening is observed, but since results can be affected due to the observer's bias, it is better used along with some other tests. 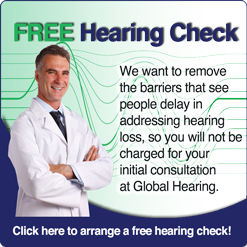 Hearing loss in both ears is referred to as bilateral hearing loss. Ability to hear with both ears. hearing devices worn in both ears simultaneously. This is the largest and the most powerful of all traditional hearing devices. It is as big as a pack of cigarettes and can be worn on the belt on kept in a pocket. A small wire carries the sound to the earpiece. Mechanical vibrations carried to the ear through the bones of the skull is referred to as bone conduction. Brain Fog is a term that refers to the side effects of damage to the vestibular system such as groping for words, forgetfulness etc. Canal Hearing Aid- A hearing device that can be fitted completely within the ear canal. CART- CART stands for Communication Access Real Time Translation. Central Auditory Processing Disorder (CAPD)- CAPD is a language disorder that makes it difficult for one to perceive and process the information. Kids with CAPD find it difficult to understand verbal instructions. Central Nervous System- Part of the nervous system comprised of the brain and spinal cord is referred to as Central Nervous System. Ceruminosis- Increased ear wax build up in the ear canal can block it and cause some degree of conductive hearing loss. Cilia- The tiny hairs within the cochlea are referred to as Cilia. Clinical Hearing Loss- Hearing loss that can be detected by conventional testing frequencies between 125 Hz and 8,000 Hz. Cochlea- Cochlea is snail shell shaped and has 2 and a half turns. Incoming sound waves are converted into signals by the cochlea which are further sent to the auditory nerve. Cochlear Implant- It is a device that is implanted in the cochlea to substitute for the damaged hair cells. A cochlear implant work well when most of the hearing aids don't. So, they are a very good substitute to hearing aids. Cochlear Nerve- Also known as acoustic nerve or auditory nerve, cochlear nerve carries the signals from the inner ear to the brain. Cognitive Behaviour Therapy (CBT)- Cognitive Behaviour Therapy is a counselling technique used for people suffering from tinnitus. Cognitive, Distraction, Relaxation and Imagination are the 4 main techniques included in this therapy. Complete Audiological Evaluation-A series of hearing tests performed to evaluate a person's hearing ability is known as Complete Audiological Evaluation. Completely in the canal hearing aid (CIC)-This is the smallest of all hearing aids which is fitted completely in the ear canal. Compression- This is an automatic gain control system in a hearing device that helps in reducing the amplification as sounds get louder. This is to make the sound comfortable for the person. Conductive Hearing loss- Conductive hearing loss is a form of hearing loss that arises in the middle ear, external ear canal and ear drum. This hearing loss comes about when movement of the bones in the middle ear is restricted or from a damaged ear drum. Congenital Hearing Loss-Hearing loss from birth or that develops in the first few days after birth is known as congenital hearing loss. It is not necessarily due to heredity. Contralateral routing of sound hearing aid- This hearing device is specifically designed for those who have normal hearing in one hear and are unable to hear anything from the other. CROS picks up sound from the non hearing side and transmits to the better side so that the person can hear from the deaf side as well. Conventional Hearing Aid- These hearing aids are not much in trend nowadays. Analog circuitry was used in conventional hearing aids, unlike modern hearing aids that use digital bit. Cued Speech- It is a visual representation of the sounds of spoken language that uses 8 hand shapes and 4 different cues on the face combined with natural mouth movements. deaf- A person with severe or profound hearing loss is deemed deaf. Decibel (dB)- Decibel is used to measure the intensity of sound. This is used to determine the degree of one's hearing loss. Desired Sensation Level (DSL)â€“ This is a hearing aid fitting method which is specially designed for children. Differential diagnosis- To determine which of the two or more diseases with similar symptoms the patient is suffering. This is done for thorough and accurate diagnosis. Digital Hearing Aid- Digital hearing aids amplifies the sound in bits and not in voltage. This is how computers also work. Diplacusis- The word originates from two Greek words diplous which means double, and akousis which means hearing. Also known as Paracusis duplicata, diplacusis refers to abonormal perception of sound. Diplacusis binauralis- This refers to a medical condition in which the perception of sound is different in both ears. Diplacusis dysharmonica- refers to a condition in which the perception of the same sound is at different pitch in each ear. Diplacusis echoica- As the name suggests in this condition, the original sound is followed by an "echo" , hence the same sound is repeated. Directional microphone- Directional microphone allows a person to focus on a sound coming from one direction rather than picking sounds from all directions. Discrimination - Discrimination refers to the clarity of hearing and one's ability to distinguish sounds. Dizziness - Dizziness is what some people describe as giddiness, light-headedness, faintness, or disequilibrium. Earbud: Earbud is like a small earphone that is inserted into the ear canal. This earphone look alike device delivers sound to the ear and some people find it more comfortable than earphones. Eardrum- Eardrum covers the entrance of the middle ear and also responds to the incoming sounds by vibrating which helps the process of transmitting sounds to the middle and inner ear. Eardrum perforation- This refers to the hole in the eardrum. Ear Infection- Viruses or bacteria cause ear infection. Ear Wax- Medically referred to as Cerumen, ear wax protects the ear from infection by keeping the inner skin dry. Eighth cranial nerve: Also known as vestibulocochlear nerve. Eighth cranial nerve transmits hearing and balance information to the brain. If damaged, one experiences loss of balance, nausea, dizziness, hyperacusis etc. Electrical auditory brainstem response testing (EABR)- This test is performed to see how the auditory system of a child is responding to the stimulation generated by cochlear implant. Electronystagmography (ENG): Tests carried out to gauge the interaction between eye muscles and balance parts of the inner ear. Etiology- The cause of a disease or problem. Evoked response audiometry (ERA): It is a hearing test that contains EEG (electroencephalograph) and computer analysis to gauge brain's response to incoming sounds. External Ear- Outer portion of the ear which is visible from outside. Coping with Tinnitus- Effective ways to help you! Cope hearing loss early & enjoy your Christmas!